About a year ago I was diagnosed with osteoporosis. It’s a common condition among people with EDS as joint pain can make it difficult to exercise and inactivity can lead to weak bones. I wrote a blog post at the time which explained the issues involved called ‘Dem Bone Scans’. Since being diagnosed I’ve had further bone scans and blood tests to monitor the problem and help form a treatment plan. One of the blood tests found I had a low P1NP score, which is a bone turnover marker (P1NP = total procollagen type 1 N-terminal propeptide, in case you wondered 🙂 ). 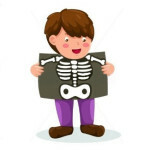 Bones are constantly re-growing to supply the body with calcium and to repair microscopic damage. The entire skeleton is replaced every 10 years. Bone turnover markers are a way of assessing this process. So a low P1NP score means my body is re-growing bone at a low rate, which isn’t good. My P1NP score was 21 mcg/L. Typical adult male values range from 22-87 mcg/L. A low P1NP score is common after a period of starvation, but it usually increases when nutrition improves. I had a period of 3 years when I wasn’t getting enough calories and became very thin. However that ended over two years ago, so my P1NP score should have returned to normal. Many of the drugs used to treat osteoporosis can cause a person’s P1NP score to reduce as a side effect. At a clinic appointment six months ago the rheumatology consultant told me I was a poor candidate for drug treatment as it may lower my P1NP score even further, so the drug could make matters worse. Consequently, since being diagnosed with osteoporosis, I haven’t been receiving any treatment. Whatever caused the changes they are very good news and consequently the consultant recommended continuing without any drug treatment. I’ll have another bone scan in 12 months. Hopefully I’ll carry on improving unexpectedly and without reason. Was the six pack fosters or carling when you were 21?! How many skeletons do you think I have produced during my lifetime? How often do you have DEXA scans Ceri? I’ve only had one in 2010 and I thought with EDS you were supposed to have them every 3 years – must check this with my GP if I ever get to see her again (currently unable to get an appt as she is booked up for the next 2 months!). I don’t know if there’s a recommended gap between scans, sorry. My first three scans were 5 years apart, but once my bone density was found to be low they’ve been much more frequent. My last three scans have been 6 months apart.